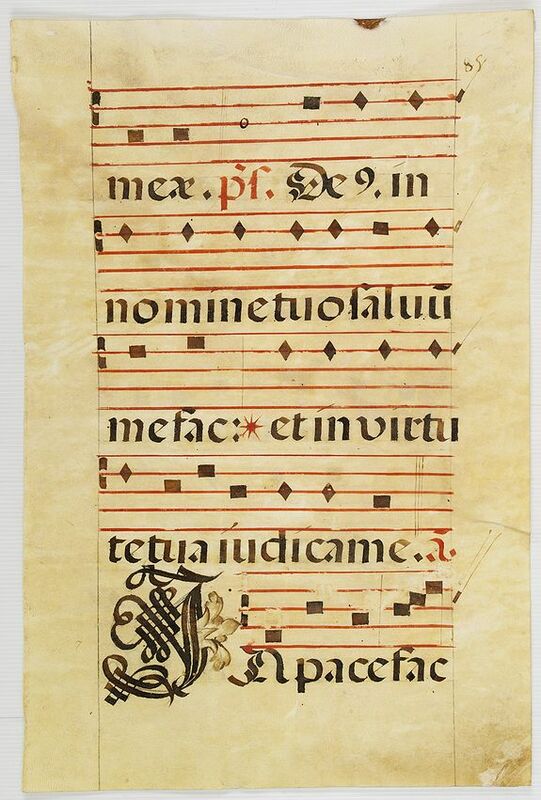 ANTIPHONER - Leaf of manuscript music from an Antiphoner. Title : Leaf of manuscript music from an Antiphoner.. Date : Probably Spain, c.1625. Size : 21.7 x 14.2 inches. / 55.0 x 36.0 cm. Description :This leaf is from an Antiphoner of Spanish origin on extremely heavy vellum (most likely ox) in Latin. Music is on a stave, inked in red, formed of five lines in black ink. Text is in a Spanish rounded gothic hand (Rotunda). On the first line there is a wonderful initial I .There are five lines of music and verse. VERSO: Five staves of five lines in black ink. Condition : Manuscript leaf, written in Latin on vellum. Good condition.